CMEMS INS TAC also collaborate with EMODnet and in particular EMODnet-Ingestion that seeks to identify and to reach out to other potential providers in order to make their data sets also part of the total offer. It aims at streamlining the data ingestion process so that data holders from public and private sectors that are not yet connected to the existing marine data management infrastructures can easily release their data for safekeeping and subsequent distribution channels as illustrated in the figure above. 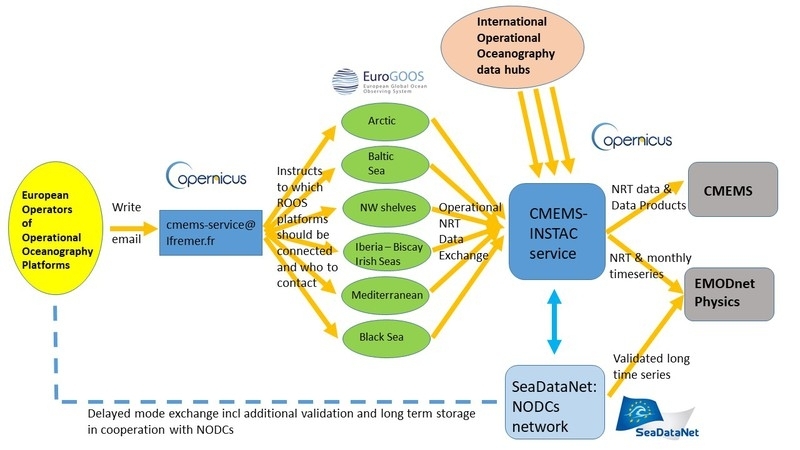 See https://www.emodnet-ingestion.eu/operational-data/how-can-you-join-the-operational-oceanography-data-exchange for more details .